Presidential inaugural ceremonies are perhaps the most widely known of the numerous ceremonies held at the U.S. Capitol. The Architect of the Capitol (AOC) erects the inaugural platform on the Capitol's West Front, sets up the necessary seating and fencing on the grounds, and coordinates other activities with the Joint Congressional Committee on the Inaugural Ceremonies (JCCIC) regarding all of the physical arrangements that are necessary to accommodate this event. The 20th amendment to the Constitution specifies that the term of each elected President of the United States begins at noon on January 20 of the year following the election. Each president must take the oath of office before assuming the duties of the position. With the 2017 inauguration of Donald J. Trump, the oath has been taken 72 different times by the 45 Presidents of the United States. This numerical discrepancy results chiefly from two factors: a president must take the oath at the beginning of each term of office, and, because Inauguration Day has sometimes fallen on a Sunday, four Presidents (Hayes , Wilson , Eisenhower , and Reagan ) have taken the oath privately before the public inaugural ceremonies. In addition, President Arthur took the oath privately following the death of President Garfield and again two days later in the Capitol. Grover Cleveland is considered the 22nd and 24th presidents, having served two nonconsecutive terms (1885-1889 and 1893-1897). 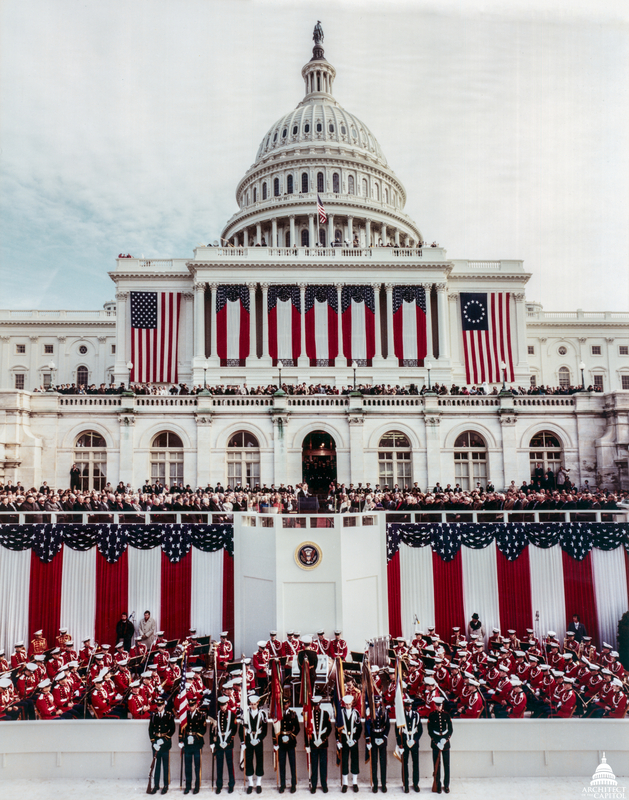 Read about Vice Presidential Inaugurations here. First time that a former president (George H.W. Bush) attended their son's inauguration as president. First time that the ceremony was broadcast live on the Internet. First inaugural that fell on the Martin Luther King Jr. holiday. First time that the oath was taken in the Rotunda. First inaugural that fell on a Super Bowl Sunday. The Bible was placed on a marble-topped table that was built for the second inaugural of Abraham Lincoln. The table was constructed with an iron baluster cast for the Capitol dome in the 1860's. First time a television camera was placed inside the president's limousine from the Capitol to the White House. Outdoor band concert was held on the West Front lawn on the day before the inaugural. 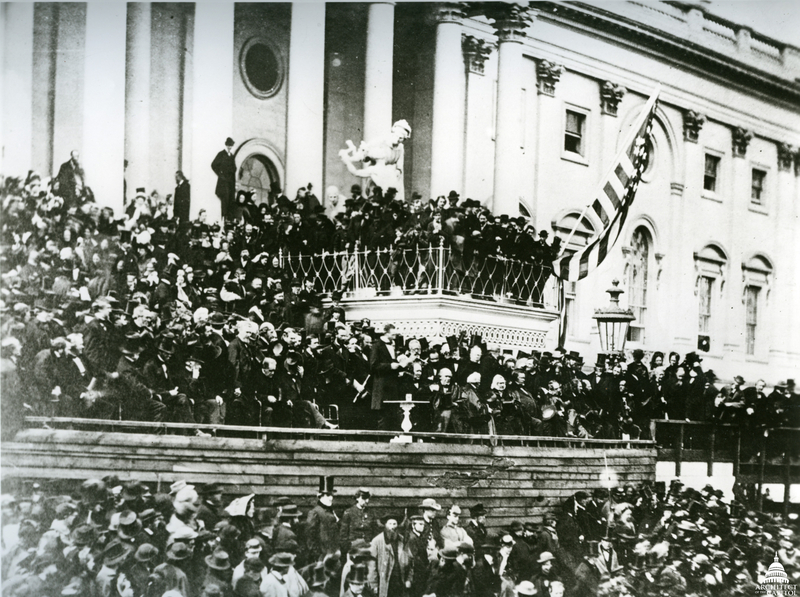 First inaugural held on the West Terrace of the Capitol. First time that room EF-100 was used as a holding room. First closed-captioning of television broadcast for the hearing impaired. First post-inaugural luncheon held in Statuary Hall. Post-inaugural luncheon was partially televised. Nine inaugural balls were held. First time that an inaugural ball was held in a legislative building (Rayburn House Office Building). Balls were transmitted by satellite to 32 ballroom sites across the country. Folding chairs instead of wooden benches were used on the East Plaza. Used an old family Bible; second Bible on lectern had been used at inauguration of George Washington. At Carter's request, the traditional inaugural luncheon was not held. First president to walk all the way from the Capitol to the White House with their family after ceremony. First time that an outgoing President left from the Capitol Grounds aboard a helicopter. Solar heat was used in the reviewing stand. Provisions were made for the handicapped to watch the parade. First unelected vice president to assume the presidency. First vice president to assume the presidency under the provisions of the 25th Amendment to the Constitution, which specifies that, upon the resignation of the president, the vice president shall become president. Only persons with special invitations to the ceremony were admitted to the Capitol Grounds. Two Bibles were used in the inauguration; they were family heirlooms, dated 1928 and 1873. First time that a press gallery was installed on the Capitol Grounds. First use of a bullet-proofed, closed limousine. First time that the oath was administered in an airplane (Air Force One, a Boeing 707, at Love Field in Dallas, Texas). First time that the oath was administered by a woman, Sarah T. Hughes, U.S. District Judge of the Northern District of Texas. First president to be inaugurated on the extended East Front. First time that both parents of the president-elect attended their son's inauguration. As the first Catholic elected president, Kennedy was the first to use a Catholic (Douay) version of the Bible for their oath. First inaugural parade for which Army flame throwers were used to clear snow from Pennsylvania Avenue. First appearance of the Air Force Academy Band in the parade. First time that the parade was televised in color (NBC). First inauguration celebrated with five balls. Last president to wear traditional stovepipe hat to the inauguration. First time that a president was inaugurated for a term limited by the Constitution (22nd Amendment). First presidential luncheon, held in the Old Supreme Court Chamber (S-228) in the Capitol. Broke with custom by reciting their own improvised prayer instead of kissing the Bible. A presidential preference made homburgs an inaugural must, displacing traditional black toppers. First inauguration to be televised. First president to take the oath of office for a third term. First president to be inaugurated on the January 20th date, a change made by the 20th Amendment to the Constitution. First inaugural to be recorded by a talking newsreel. First time an ex-president (William Taft) administered the oath of office as Chief Justice. 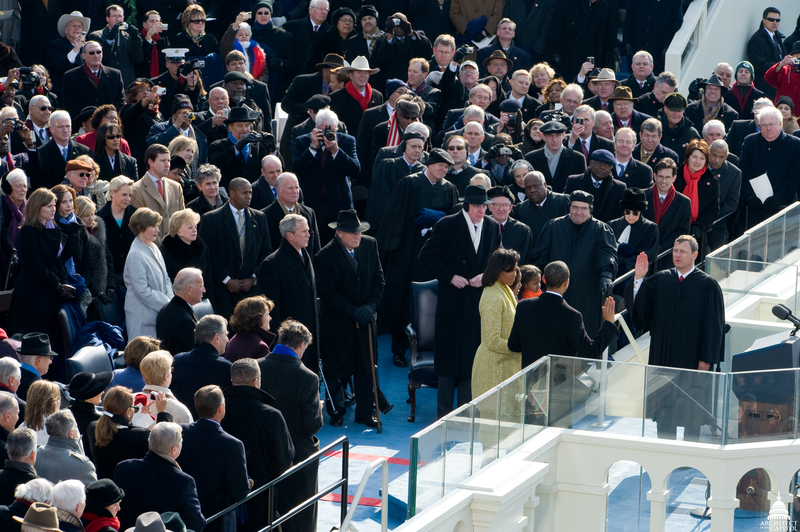 First inaugural to be broadcast nationally by radio. Oath of office given by the president's father, a Vermont Justice of the Peace. First president to ride to and from their inaugural in an automobile. First use of loudspeakers at an inaugural. First use of the steel-framed inaugural stand that was used until 1981. Broke the precedent by taking the oath on a Sunday. First time that the oath has been taken privately in the President's Room at the Capitol. First time that floodlights (as opposed to temporary searchlights) were used to illuminate the Capitol dome during an inaugural. First time that women participated in the inaugural parade. The traditional inaugural ball was suspended. First time that a president's wife rode with her husband in the procession from the Capitol to the White House. First use of an automobile in an inaugural parade (President Taft was not an occupant). First time that the dome was illuminated; temporary searchlights were used. First time that telephones were installed on the Capitol Grounds for an inaugural. The only President not sworn in on a Bible. Mr. Ansley Wilcox, at whose home Roosevelt took the oath of office, wrote in 1903, "According to my best recollection no Bible was used, but President Roosevelt was sworn in with uplifted hand." First time that the House of Representatives was allowed to join with the Senate in making arrangements for the inaugural. President Abraham Lincoln's inauguration at the U.S. Capitol 1865. First inaugural recorded by movie camera. Had glass-enclosed reviewing stand in front of the White House. First time the oath of office has been taken in the Vice President's Room of the Capitol. Two ex-presidents (Grant and Hayes) were present at this ceremony. The first time that a mother of the president attended the inaugural ceremonies. First president to review the procession from a stand in front of the White House. First president to take the oath of office in the White House. Was sworn in prior to Inauguration Day, because it fell on Sunday. Took oath privately on Saturday, March 3, and publicly on Monday, March 5, 1877. First time that a congressional committee called for the president at the White House and escorted him to the Capitol. First time that the governors of the states were invited to participate in inaugural events. First instance of the Chief Justice administering the oath of office to the vice president upon the death of the president. First time that African-Americans participated in the inaugural parade. First inaugural known to have been photographed. Drove to and from the Capitol standing up in their carriage. Affirmed (rather than swore) the oath of office. Broke precedent by not kissing the Bible, but merely placing their left hand on it. First president to deliver inaugural address without referring to notes. First inaugural to be covered by telegraph. First known newspaper illustration of a presidential inauguration (The Illustrated London News). First vice president to assume the presidency due to the death of the president. First president to arrive in Washington by railroad for their inaugural. Longest inaugural address (10,000 words). Broke precedent by beginning address, taking oath, and then resuming address. First official planning of a parade to follow the inaugural at the Capitol. The parade or inaugural planning committee was appointed by the local political organization of the party victorious in the national election. First time that outgoing and incoming presidents (Jackson and Van Buren) rode together in a carriage to the Capitol for the inaugural. First use of inaugural programs. First use of floats in an inaugural parade. First time two inaugural balls were held. First president to take the oath of office on the East Portico of the Capitol. First president to take the oath out-of-doors in Washington. First inaugural held in the Hall of the House. First inaugural ball to be held on the day of the inauguration. The United States Marine Band set a precedent by playing for the inaugural ball. Began the custom of writing to Congress to accept the inauguration and arrange the time for the ceremonies. The first and probably only president to walk to and from their inaugural. First president to be inaugurated at the Capitol in Washington, D.C. (in the then Senate Chamber). First newspaper extra of an inaugural address, printed by the National Intelligencer. Cox Corridors mural in the U.S. Capitol depicting Washington's Inauguration, 1789. First president to receive the oath from the Chief Justice of the United States (Oliver Ellsworth). Shortest inaugural address (135 words). Oath of office taken out-of-doors (balcony of Federal Hall in New York City). Set the precedent of kissing the Bible after the oath. Fireworks concluded the day's celebration, all of which was paid for by private citizens. Because of pressing public business, the inaugural ball was held on May 7. The president's wife, Martha, did not make the trip to New York.